Full Service History – possibly the three most abused words in the whole car-buying dictionary. When buying a car, it is vital to understand that how well it has been maintained is the most important clue to how well it is likely to run in the future. And it also shows how much affection the last owner bestowed on the car. STEP 1 – WHEN SHOULD THE CAR HAVE BEEN SERVICED? Different cars have different service requirements. Most cars are supposed to be serviced at set intervals (e.g. every 12 months or 10,000 miles, whichever is sooner), but increasingly cars have ‘variable’ service intervals where the car’s computer monitors its condition and suggests when it needs servicing (which can sometimes be up to 2 years or 20,000 miles). The easiest way to find this out is just to call your local main dealer and ask someone in the Service Department. STEP 2 – WHAT HAS BEEN DONE? 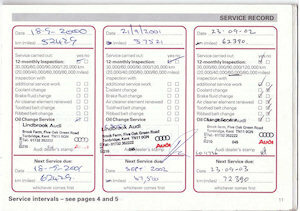 The car’s Service Book should have a garage stamp, and a recorded date and mileage for every service. It is usually quite easy to tell whether the last owner has used a main dealer; however, after the first 3 years many people turn to a much cheaper local mechanic. For most cars this is nothing to worry about, but of course you don’t really want Billy’s Car Repairs to have been looking after the Lamborghini Murcielago you are thinking of buying! Sometimes, instead of stamps (or in addition) there will be actual receipts. These are even better because they will list any additional work done… and are much more difficult to forge. Full Service History should mean that the car has been serviced EXACTLY as recommended by the manufacturer throughout its ENTIRE life… but many sellers do not follow this description. So… for John at a certain independent car dealer in Watford, a stamp in the service book every 2 1/2 years (because the Nissan Micra has only covered 13,000 miles in its life) is NOT full service history, as a five-year-old car should have at least 4 stamps. It may be time to change that advert, John. Don’t forget to study your history!